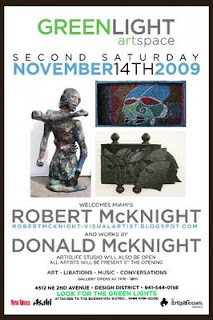 Also showing with me is Donald McKnight with his thought provoking surreal dreamscapes. His paintings will provoke conversation, emotion and question. Looking at both of our work you will begin to see a thread that ties us together, aside from the fact that we are brothers, we attempt to uncover layers of philosophical thought and take a strong look at the raw distinction between Art and decoration. Looking good is important but at the same time we want to speak to you the viewer. We are the artist known as MIAMI.